Lagunitas is one of those dark horse breweries we sometime forget about until we see a bottle or tap of their stuff, and hastily remember that their ales are actually almost always really quite excellent. It's pours a dark golden color, with a frothy head. Not much carbonation to be seen, and lacing and retention are both excellent. A beautiful looking beer in other words. Sniff, and a nice meld of fruits and spices will hit you right up front, flanked by hops. There's a lot to Sumpin' Wild, and you can pick it all up through the nose. This is one you can sit and smell for a while, and truly enjoy. Then again, in the end it's all about the flavor, and it tastes as good as it smells. The hops hit a bit harder than I had expected from the nose, but they're still part of a delicate texture, and they go well with the spices. Above all, this is a mildy sweet beer, and how all said flavors work so well in harmony is beyond me, but this is one to sip like a good cognac. Mouthfeel is medium bodied, and there is a distinct lack of carbonation might not be for everyone, but I like it. Put this one up for a contender for the most complex yet surprisingly drinkable beer of the year. 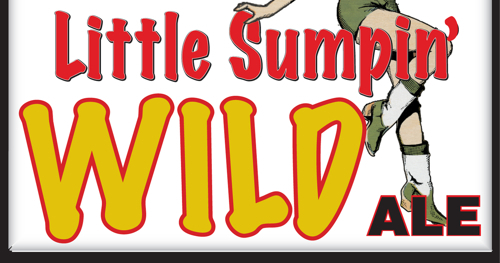 Vote for Lagunitas A Little Sumpin' Wild Ale: It’s your civic duty!